"Quick and effective at removing make-up, including waterproof mascara, while being kind to skin, these nourishing wipes are suitable for all skin types. Containing Pro-Vitamin B5 to refresh and tone the skin these non-alcohol and 100% of free wipes won't dry the skin or leave a greasy residue." I could have sworn I received a packet of these wipes in a previous beauty box, except I can't figure out which beauty box it was. Nevertheless, Simple facial wipes are fantastic. I will be bringing these with me to Tasmania this weekend for my wedding! "The 3-in-1 sunscreen, moisturiser and sheer foundation provides a light, non-greasy, sheer tint and can be used daily to nourish, protect and help prevent the appearance of premature ageing caused by UV exposure. Invisible Zinc has been formulated to keep your skin healthy for many years to come. Available in light and medium shades." On first swatch at the back of my hand, it was too dark. However, when I applied it on my face, I was able to blend it out and they were not kidding when they said "sheer". My face just looked bare. However, I'm sure that if I applied another layer or two over, it'd be probably be too dark. "Its sheer, weightless texture works to exfoliate the skin's surface and fade signs of sun damage. The ultra-light formula corrects uneven skin tone for a brighter, smoother, more radiant complexion. It works to sustain the results of professional peels and wears beautifully under a moisturizer or serum. Great for all skin types. This product contains 8% glycolic acid which may increase your skin's sensitivity to the sun and the possibility of sunburn." 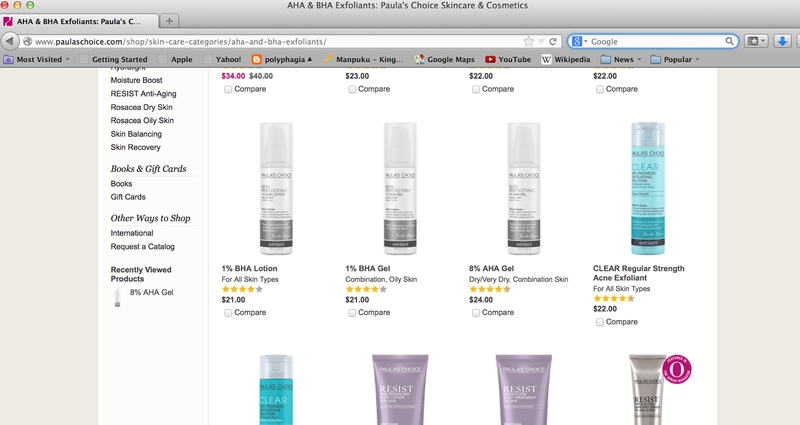 I find it weird that on the Paula's Choice website, it is recommended for dry/very dry, combination skin, as it contradicts what it says on the bottle. Furthermore, I'm disgusted (yet again... I've ranted about this here) that we're being charged $45.80, when it's only USD$24.00 on their American website. Talk about discrimination! Not happy, Jan! "Natrasan 99% Natural Instant Hand Sanitiser is a fast acting, long lasting and effective non-alcohol-based hand sanitiser. This organic formula kills 99.9% of germs in 10 seconds and leaves your hands hygenically clean, ultra soft and naturally moisturised without the need for water or towels. Keep in your handbag and feel vibrant and fresh all day long! Inside out." The claim that it is non-alcohol-based is false. In the ingredients, it says "Alcohol (Derived from Sugar Cane)". I've used it about twice now, and it's a good hand sanitizer. The only con is that it doesn't have a cap, so I wouldn't be keeping this in my handbag, as I have a sneaky suspicion that my hand bag will be 100% germ free at the end of the day. "COLORSMASH Hair Shadow is the premium brand of temporary hair shadow in the hair & beauty industry. Offered in a variety of vibrant colors, it's inspired by the popular hair chalking trend and the perfect add-on for all occasions. Smash it on. Seal with spray. Wash it out." Received this in a previous month's box, July 2013 to be specific (read here). Although it is a different colour to what I've received, this is still a completely useless product for me, as I would never use it considering my dark, almost black hair, and it being such a wild colour that even if it shows up, it won't be what I'd call "work appropriate". "Formulated without Silicones, it penetrates hair to instantly increase hair's moisture by 41% without leaving behind any greasy reside so it doesn't weigh hair down." This is a promising product that I will use. I used it this morning and it has a really strong herbal smell, which I'm not the biggest fan of. It is also quite runny... almost the consistency of water. It'll be interesting to see if this will moisturise my dry hair. Overall, I'm not entirely impressed with Lust Have It (yet again). This month has reassured me that I made the right decision choosing not to accept their "special" offer of $150 for a 12 month subscription offered to me a week ago. What did you get in your Lust Have It box? Were you impressed? This box seems to be a little bit below average. I would love to see a hair chalk that actually works for dark hair though. Simple facial wipe is amazing. The only face wipe that didn't irritate my skin. I didn't get the hand sanitiser in this box but I've bought them before and they do come with a cap. Looks like yours got misplaced somewhere along the way. My box still hasn't even been dispatched, and seeing that I'm an annual subscriber you would think I'd be in the first dispatch group, since I paid almost a year ago... not very happy about that. I think I need to try the simple wipes. I am gonna keep trying out different wipes until I find the one suitable for me. I also get angry about the price increases here but think about it like this. The minimum wage in the US is currently $7.25 per hour. The minimum wage here is $16.37 per hour. Also remember that US prices don't include tax which get added on at the end, whereas our prices include GST. The cost of make up here is *relatively* comparable when you think about it like that. Oh no, you got hair chalk again! I got a similar box, but received a Model Co lipgloss instead! Haven't received mine yet but after seeing the contents of yours I am not too excited to receive mine. I got the exact same box! Was so disappointed, I wouldn't have cared how late it arrived if it had actually been a decent box.